Welcome to the Dartmouth QSN Chapter page! 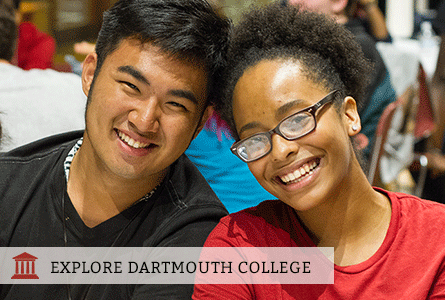 Our chapter is known on our campus as the Dartmouth Quest for Socioeconomic Engagement (DQSE). Our organization is a recognized group on campus dedicated to serving Dartmouth QuestBridge Scholars and students who are interested in socioeconomic issues. Our goals are to provide resources and a close-knit group for our scholars while creating a broader message of class awareness to the larger Dartmouth community. DQSE collaborates with various offices on campus, including our Center for Professional Development, to produce workshops for QuestBridge Scholars and DSQE members on financial aid, money management, and searching for internships. We also offer a lot of social events for our QuestBridge Scholars to bond! There’s usually a lot of movie nights, study sessions, picnics, ice-skating in the winter, and water balloon fights in the spring. Some of our most popular events include our termly Dinner Discussions. These serve as spaces for reflection as DQSE talks about different topics, including: class and relationships, classism and meritocracy, and the "Dartmouth identity." These dinners become great conversation starters to engage with all of campus, as we open these discussions to the public. Once a year, we also host a discussion panel where we invite Dartmouth faculty to provide their insight and facilitate dialogue between students. If you want to find out more about our organization, please feel free to contact us!